Painting and Illumination in Early Renaissance Florence 1300-1450, The Metropolitan Museum of Art, New York, 1994-1995, no. 4c. 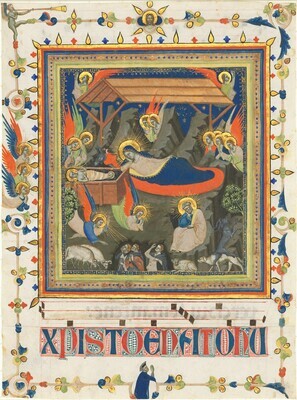 Heaven on Earth: Manuscript Illuminations from the National Gallery of Art, NGA, 2009. National Gallery of Art. Medieval and Renaissance Miniatures from the National Gallery of Art. Washington, 1975. Robson, Janet. "Florence Before the Black Death." In Florence (Artistic Centers of the Italian Renaissance) edited by Francis Ames-Lewis. Cambridge, 2012: 64, color pl. 5.